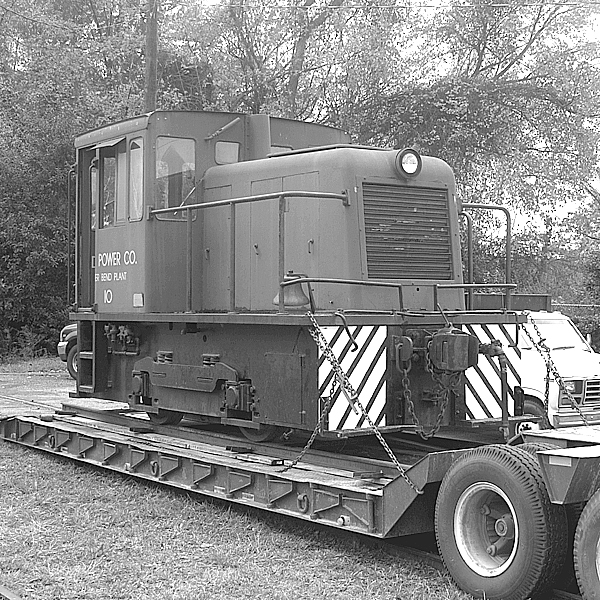 The NCRM is rightly proud of our steam locomotive, Cliffside Railroad #110, but we should also remember our smallest locomotive, our #10, an ex-Duke Power 25 ton end-cab critter built by General Electric. Our #10 started life back in April of 1950 at the General Electric plant in Erie, Pennsylvania. The little 150 hp critter was shipped from there to the Duke Power Lee Generating Plant at Pelzer, SC, and was later reassigned to the Allen Generating Plant at Belmont, N.C. Following its life of service moving coalladen hoppers and other cars around those facilities, Duke Power management determined #10 had earned a well-deserved retirement. She was moved to a storage track to await her fate. The next stop for #10 was as a museum piece. 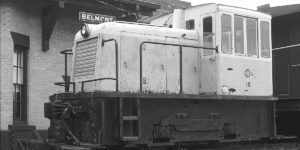 She was acquired, either through purchase or donation, by the Piedmont Carolinas Railroad Museum in Belmont, N.C., and stored there with the rest of their modest collection of equipment. 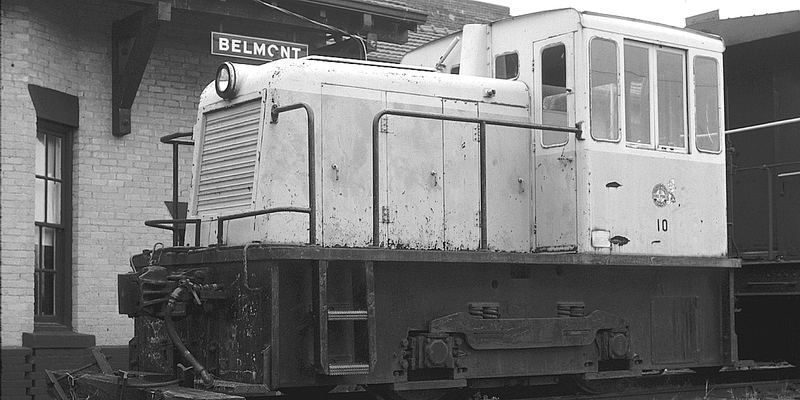 The locomotive languished there for some years, in non-operating condition, until the PCRM was evicted from their storage track. NCRM Member Gray Lackey became aware of the predicament and noted PCRM was willing to sell the critter for a reasonable price. Gray received permission to bring the unit to Bonsal, so the sale was completed and the necessary plans for moving were made. During the month of November in 2004 a crew of NCRM members experienced in moving railroad equipment of all types made their way to PCRM to collect #10 and move it to Bonsal. Star Towing of Gastonia, S.C. was contracted to haul the locomotive the approximately 150 miles from Belmont to Bonsal. 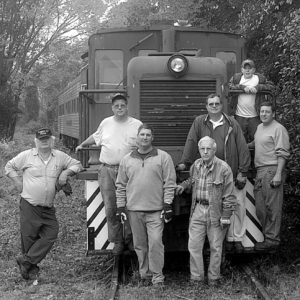 They arrived with the appropriate equipment to load and transport the little locomotive and the crew went to work. 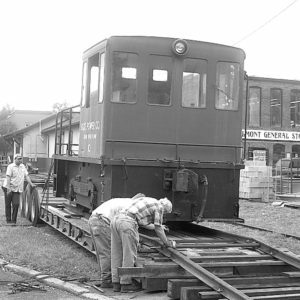 The technique for moving most locomotives is to park the low-boy trailer over the track at a grade crossing of other convenient point, building a ramp of rails up to rails secured to the bed of the trailer, and rolling the unit onto the trailer. As shown in the photos, this was done, a cable was attached to #10, and she was winched up onto the trailer. Upon arrival at Bonsal, this process was reversed with our #67 controlling the cable during the unloading process. Our #10 can be seen now on the mainline track at Bonsal behind our ex-USO Kitchen Car (home of our museum store) near the RDC and our #17. It is on long-term lease from Mr. Lackey to the NCRM for display or use as is appropriate as it is restored. Restored? Yup! Plans call for our #10 to be returned to operating condition as soon as time and money become available. Some work has already been done to inspect the “innards” of the locomotive to determine the nature and extent of the work to be done. We hope to start on this project in the not too distant future. Now, here is where YOU come into the picture. Would you like to see #10 running again? That can happen with the proper application of time, skill, willingness, time, commitment, and money. If you can help with any or all of those factors, let us know as soon as possible. You could be the one to make it happen. This can be said for all the equipment and facilities at Bonsal. 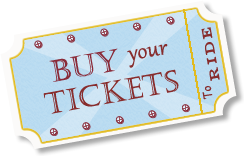 If you would like to contribute time, skill, and/or money to help, let us know. The NCRM only works with your commitment.